QUESTION: What happens of there's a power outage? Is the collar going to keep shocking? ANSWER: No, whether your dog ran out of the boundary or the transmitter is off, it will not keep shocking. Our system is built with an unique anti-over shocking design that will shock+beep for 18 seconds, then beep for 34 seconds and repeat this cycle 3 times and shut off, together with a total of 54 seconds of static shock. QUESTION: My yard has a small hill sloping down, is the signal going to reach? ANSWER: The signal will weaken going down hill since the ground will absorb the signal. We recommend placing the transmitter higher (maybe on a second story) so that it can reach the entire slope. QUESTION: How strong is the shock? It could be too intense for my little dog. ANSWER: The shock is like a static shock and it is 100% harmless to your small dog as long as it is at least 10 pounds. ANSWER: YES! Our fence transmitter can support up to 17-acres area (500 feet in all directions). ANSWER: We have a full 30-days no-risk, no-nonsense, 100% money back guarantee. Either you're thrilled, or we don't want your money! On top of that, our product comes with a 90 days manufacturer warranty and 7 days a week support. We stand by our product and take good care of our customers. While supplies last - Order Now! EXTREMELY EASY TO USE! Customized a cordless radial shaped boundary with adjustable levels 1-100 up to 500 feet in radius, forming an invisible circular fenceless perimeter to contain your dog within (LARGE ESTATE ONLY: 50 FEET HOUSE-TO-BOUNDARY MINIMUM REQUIREMENT) - - FAST! 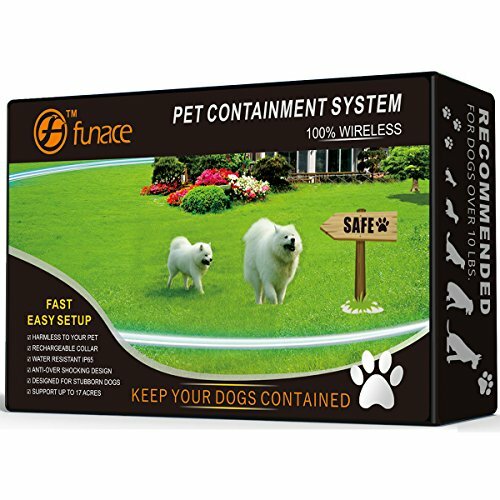 If you have any questions about this product by FunAce, contact us by completing and submitting the form below. If you are looking for a specif part number, please include it with your message.